Oh crap! Can't go to bed yet. I forgot to refill my reservoir. It's 11:30pm. Open the fridge, pull out the insulin, set it on the counter. Give it a few minutes to warm up, and come back. I've done this a million times. I could fill a reservoir in my sleep. And maybe that's what I was doing, because I can't figure out how this happened. Next thing I know, the reservoir and attached vial of insulin fly out of my hands. I can see it all happening in slow motion. My hands reaching out in an attempt to catch it. "Noooooooooo!!!!" I cry, diving for the vial. But it's too late. 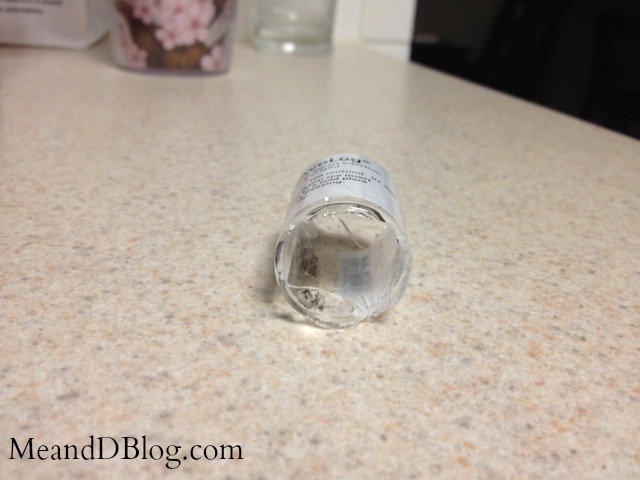 The vial of insulin smashes to the tile floor. Did I mention the vial was almost full? insulin and broken glass on the floor. ..and so did the top. 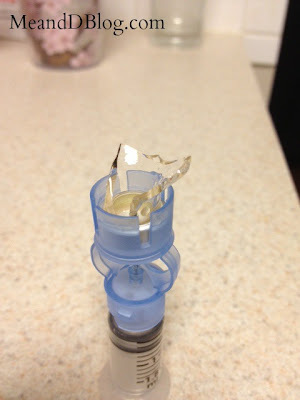 In almost 20 years of living with Type 1 Diabetes, this is only the second time I've broken a vial of insulin. And of course it would be super late at night. 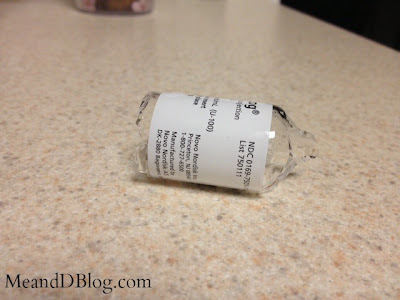 And my last vial. Two choices: go to the pharmacy at midnight to get more insulin, or fill the reservoir with the dregs of a couple vials that have been sitting in the fridge for who knows how long. I was exhausted, and chose the dregs. So I got to go to the pharmacy at 7am instead of midnight. And be miserable. And late to work. Brightside: I LOVE my local Walgreens pharmacy! 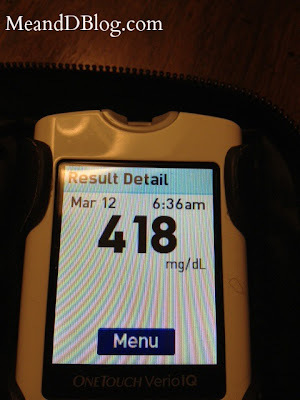 They had my insulin ready to go in a jiffy when I said it was kind of an emergency. No questions asked, no "try to remember to refill your prescription several days in advance." Just a promptly filled prescription handed over with a smile. Thank you! Lessons learned: always keep at least two vials of insulin on hand. And don't trust sketchy dregs of insulin in the fridge. And it's damn hard to get rid of that insulin smell. Darn it! BTW, I really like my Walgreens Pharmacy, too. They have helped me avoid potential hypo episodes by paying attention to the little things, like which OTC decongestants I try to purchase. YAY! Oh man! I've heard about breaking insulin vials, but it's never happened to me before. I must say, you broke that one in spectacular fashion! The last bottle I broke (the only one actually) broke in my purse and I didn't realize it. I was walking around the building with a friend when I thought I smelled insulin. I immediately dismissed it because why would I smell insulin. That dreaded smell wouldn't go away though. 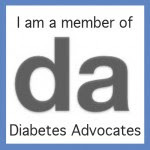 When I finally stopped to look in my purse, I saw my diabetes bag was wet and I knew instantly. That purse never smelled the same again. lol. I'm a nurse and I've broke a few vials before. I guess I'm just odd though (or maybe it's because I'm not diabetic) but I loveeeee the smell of insulin.